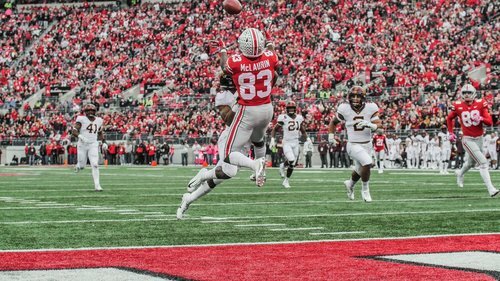 Social media and more from Ohio State, where the underdog Gophers will be trying to beat the Buckeyes for the first time since 2000. We'll have updates from before the game until the final play. Fleck, Lose the sunglasses. Hard when talking to players on sideline and timeouts when they can't read you by not seeing your eyes. Looks like Batman and Robin. Besides the sun is not even out. #Gophers go three-and-out. Jacob Herbers punts to OSU 47, and Antonio Shenault makes solid tackle on return. #Gophers force Ohio State to punt on first possession of third quarter. Carter Coughlin's second-down sack for 10-yard loss was key. Punt downed at the Gophers 1. Second half underway. Ohio State starts at its 25 after touchback on kickoff. Refs need to make calls on both sidea. What a great picture, reunion of former @RamsNFL QBs. That's a big part of it. The whole unit has been solid. That 4th and 1 call is going to bother me for awhile - replay? 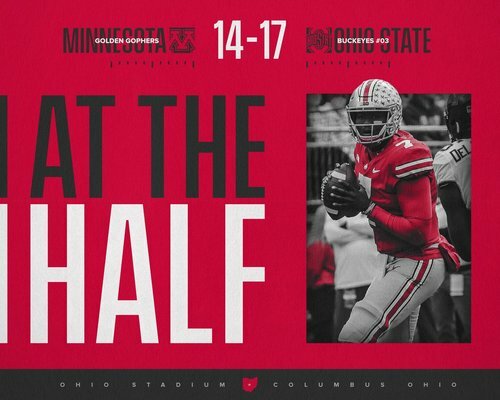 Halftime stunner: Ohio State 17, Gophers 14. Gophers playing tough. Offensive line has been really good. End first half: Ohio State 17, #Gophers 14. After #Gophers punt, Ohio State takes over at its 23 with 1:21 left in half. Ohio State takes a 17-14 lead over #Gophers on Dwayne Haskins' 36-yard TD pass to K.J. Hill with 3:59 left in second quarter. Ruling stands. Ohio State gets ball at its 24. #Gophers hits Zack Annexstad hits Tyler Johnson over the middle, but Johnson fumbles and Ohio State recovers, Play is under review. #Gophers move to Ohio State 48 on Ibrahim's 34-yard run. The interior of Gophers line is dominating. #Gophers LB Blake Cashman stuffs J.K. Dobbins for 1-yard loss on fourth-and-1 from the Minnesota 17. Gophers ball. Gophers defense with big fourth-down stop and their sideline goes crazy. How about calling some of the holding against Ohio State? Ohio State converts fourth-and-3 and has ball at #Gophers 26. #Gophers cornerback Coney Durr ejected for targeting for late hit on QB Dwayne Haskins. #Gophers Coney Durr, starting in place of injured Terell Smith, penalized for late hit on OSU QB Dwayne Haskins. The hit is being reviewed for targeting. If Durr is ejected for targeting, secondary is going to be really thin with Terrell Smith already out. #Gophers take 14-10 lead over Ohio State on Mohamed Ibrahim's 3-yard run with 11:53 left in second quarter. Another impressive scoring drive for Gophers. OC Kirk Ciarrocca has a very good plan and mix of play calls. Also, the line play is big improvement from previous games. On third-and-9 from the 17, #Gophers Annexstad hits Johnson for 12-yard gain to the 5. Ohio State got away with one when the unbiased replay guy who must of been on a smoke break when the buckeyes were a half yard short of the line to gain on forth down. Terrible no call!! 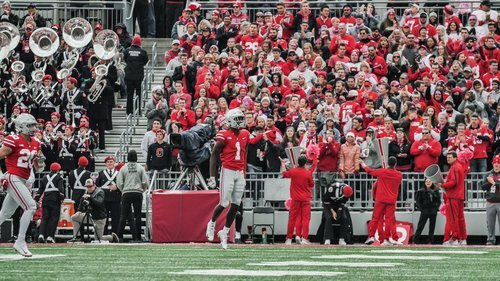 I have seen some bad officiating at the shoe but this is blatant . Icing on the cake the next play goes for 7 points for the Buckeyes!! Here's the bad spot on Ohio State's fourth-down conversion against #Gophers . Looking at replays, not sure why replay official didn't look at that. And have no idea how they moved the ball to the 41, either.